The weekly jazz jam at the Park Street Tavern returns this Tuesday June 1st with a special guest saxophonist, Steve Kortyka. (More about Steve below). Steve will join the regular lineup of Andy Woodson, Cedric Easton, and Erik Augis. In the first set, the guys will perform the music of legendary jazz saxophonist Wayne Shorter. 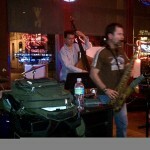 The show starts at 8:30pm with the open jazz jam commencing after the first set. Bring your instrument as all players are welcome, as well as jazz fans. New to the Columbus area, Steve Kortyka is an accomplished musician who has more than several years of performing experience. After graduating from CCM (the Cincinnati Conservatory of Music) he freelanced for a year or so playing with an number of local bands in the Cincinnati. Steve has had the opportunity to visit places all over the world traveling and playing music for the companies of Carnival Cruise Lines as well as Princess Cruise Lines. after doing ships and practicing for 4 years he has decided to return to school at the Ohio State University, currently residing in Columbus studying to get his Masters Degree studying the saxophone with professor Shawn Wallace.